I can only assume that Clint Eastwood made a thorough fact check of the events surrounding the ill fated US Airways Flight 1549 of Jan 15 2009. It is particularly important that he portrayed the events accurately because, in many ways, this film resembles an Air Crash Investigation historical record even though it is "just a movie". If Clint Eastwood's portrayal of the events surrounding the landing on the Hudson is accurate, then he may be unwittingly casting a huge amount of blame on the crew of the flight almost to the point of highlighting negligence. 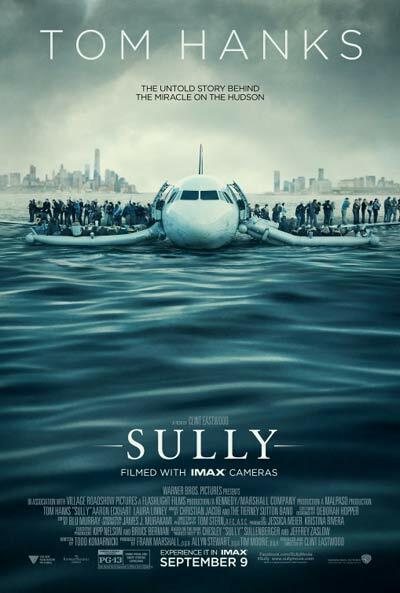 The primary focus of SULLY is whether Captain Chesley Sullenberger made the correct decision to land on the Hudson. However, what happened AFTER the aircraft ditched is also of vital importance. Although the emergency procedures carried out by the crew have been somewhat overlooked their actions were critical in saving lives. Having landed or "alighted" (as at least one airline likes to call it!) on the Hudson, the crew were responsible for the safe evacuation of all passengers and crew. Based on the events depicted in Sully, it appears certain that there was a great deal of good fortune in the fact that all lives were saved. All airline crew prepare for ditchings on a regular basis. Most airlines have large water tanks with mockup aircraft and sliderafts so that ditchings and evacuations can be accurately simulated. Some airlines even turn on the rain during these exercises and can simulate storms and rough seas. • When the aircraft lands on the water, passengers are told to fit their lifejackets, plus other pre evacuation commands. • Meanwhile, the crew should be fitting their lifejackets and launching the slideraft which is usually located at each door. • When the Slideraft is ready for boarding, the crew will then order the Evacuation. If, during a training exercise, a crew member ordered an evacuation before the sliderafts were launched they would likely fail and have to resit the testing. • Passengers should then be directed to the sliderafts. There are additional procedures which may vary slightly from airline to airline but these basic fundamentals are vital for a successful evacuation. 1. Captain Sullenberger walked into the cabin and ordered the evacuation BEFORE the sliderafts were launched. 2. I did not hear crew members shout "Fit Your Lifejacket" prior to the evacuation in the film. It is of paramount importance that all passengers and crew have their lifejackets fitted as anyone who found themselves in the water would rely on the jacket for survival. 3. Passengers were seen leaving the aircraft without Lifejackets. Some were seen in the river without lifejackets fitted and others were seen holding their lifejackets. 4. Passengers were seen jumping from the door into the river. The crew should have been stopping this from happening and directing passengers to a safe exit where a slideraft was available. 5. After Captain Sullenberger did his final check of the cabin, he boarded a slideraft which clearly had plenty of room for others. I have to ask, if there was room on the sliderafts why were passengers floundering around in the river where they were at risk of being drowned? These apparent failures in basic emergency procedures put lives at risk after the successful landing on the water. I imagine it was fortunate that the ferry arrived quickly to save many passengers from drowning. Had there been a delay in reaching the aircraft, passengers who had jumped into the river may have died. That is why the question of whether Clint Eastwood thoroughly checked his facts prior to making this film is so important. If everything that is depicted in the film is accurate then there are a lot of questions to be answered about the evacuation and how some of the basic fundamentals of emergency procedures were not followed. If the events depicted are not an entirely accurate record then Clint Eastwood is unfairly casting aspersions on the crew in a way that makes them appear negligent. I would love to know the answers to these questions and how they were raised during the investigation. Captain Sullenberger appears to have done an extraordinarily heroic job in making the decision to land on the Hudson. I felt that Clint Eastwood might have been better off starting the film with the flight and subsequent ditching and then moving on to the investigation but the movie was fascinating and memorable despite the questions I have raised. Tom Hanks' performance was faultless along with that of Aaron Eckhart. FOOTNOTE: The comments made in this review are based on many years of training for this type of event. Thankfully, I never had to experience what must have been a frightening incident for both passengers and crew.